So I have a MacBook Pro, 2018 TB with High Sierra that's bound to a Windows domain, built via JAMF. We have one admin account on the machine which our IT team use then the user account where they themselves are also admins. I should point out I have admin rights on the machine. Nothing special about these accounts as far as I'm aware. 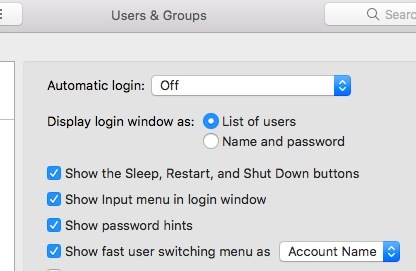 However when my user logs onto the machine, to do their work and then reboots, at logon they are only prompted for the password for the IT admin account. They don't see the username and password fields. I'm trying to go through the console logs but unsure what I'm even looking for. I should have mentioned, I have admin rights but some features are locked down via JAMF security profiles. Anyone else seen this issue? FileVault is the clear case where the system will boot to a pre-OS screen and show you only the file vault enabled accounts. When you sign in and authenticate as one of these accounts, that unlocks a decryption key that allows the OS to be readable and starts the actual OS boot process. You can determine which accounts have been enabled in FileVault by examining that system preference once you’re logged in to the running OS. Your IT team should investigate JAMF Connect which extends the typical log in screen to let any AD allowed account log in. It also can be provisioned so that membership in an AD group maps to an admin local account or a non-admin local account. It’s an amazing tool and far better than binding which can have many down sides. Since you have Admin privileges, open users and groups > Log in Options > Log in and set it to show List of users. Not the answer you're looking for? Browse other questions tagged macos login login-screen . How can you switch users at the login screen, without administrator access, with only one local account (the administrator) and many network accounts? How can I make a secondary encrypted volume open during the boot process? How to set a default user on the login screen without automatically logging in?